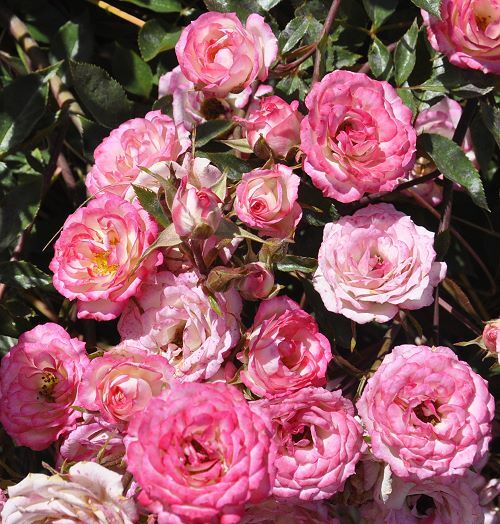 Picked when in bud or just after the bicolor petals have begun to unfold, Magic Carrousel Rose blossoms are perfect for donning a wreath or garnishing a cake. Everything about this rose is magic. This spectacular row is about 10 feet long, 5 feet wide and 4 feet high. It was planted with 3 of our 3 inch pots and is about four years old. Rose leaves were often included in teas in times past, like in this one from the 1600's. Chop finely (once dried), and make as normal. (Steeped in water brought to a boil). Try this warm or iced. A true blast from the past. A Garden of Miracles by Jill Davies. 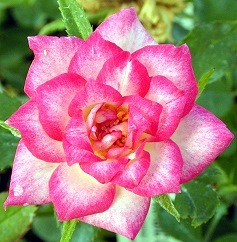 Magic Carrousel Rose is one of six plants chosen to be in our Crafter's Herb Garden Six Pack.